Five walkers were rescued after getting lost in the dark on the Pennine Way and suffering early symptoms of hypothermia. Forty volunteer rescuers from three teams straddling the Scottish-English border took part in the operation to find the group on the northern-most section of the national trail. Two Search and Rescue Dogs Association handlers and their animals joined the Border Search and Rescue Unit, Northumberland National Park and North of Tyne Mountain Rescue Teams and a helicopter from RAF Boulmer in Northumberland in the search. The walkers, two fathers from Wooler in Northumberland, with their sons, two aged 19 and one 15, were eventually airlifted from Lamb Hill by the Sea King helicopter. Damon Rodwell of BSARU said the group set off from Wooler with the intention of walking to their home in Byreness on Monday. “At 25 miles over hilly terrain it was an ambitious target, and leaving Wooler at lunchtime, they had only six or seven hours of good light in which to reach it. 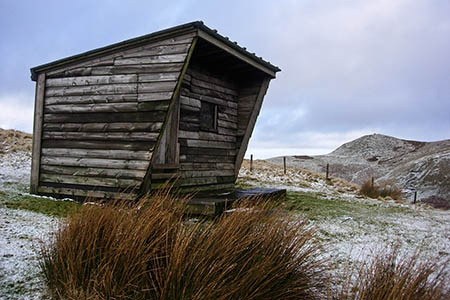 “Cheviot summit was knocked off by about 3pm, and the long ridge walk past Windy Gyle and along to Lamb Hill refuge hut consumed the remaining hours of daylight. “After a discussion in the hut, and taking into consideration the fact that they were still ten miles short of their objective, carrying only one torch and inadequate clothing, they arranged to cut the adventure short with a pickup at the road near Chew Green, about four miles further on. “The Pennine Way south of Lamb Hill is indistinct and boggy, and within half a mile the group had become disorientated. “One of the 19-year-olds was unable to continue with leg problems, and the group put in a call to mountain rescue at 8.20pm. Mr Rodwell said 22 members of his team congregated at Pennymuir hut in the Kale valley. He said: “Two groups deployed onto the hills between south of Lamb Hill by Land Rover and a third was preparing to make its way to Chew Green to sweep northwards when the bedraggled party was located huddled in long grass by the helicopter and transported to Pennymuir. Mobile phone contact was initially established with the missing young people by one of the incident controllers, before the group’s mobile phone battery ran out. They were unable to give their exact location. An initial rapid response from the English side involved two search and rescue dogs and their handlers, and four rescue team members. The search dogs began moving from Blindburn farm in Upper Coquetdale up the ridge past Yearning Law towards Lamb Hill and up Buckham’s Walls Burn towards the shelter on Lamb Hill. The full teams were called out at about 10pm, with emergency vehicles and additional team members en-route to the rescue vehicle at Blindburn. Mr Rodwell said: “The group appears to have underestimated the challenge they had set themselves and started a bit later in the day than they should have. “No doubt they’ll take away a couple of lessons from their day in the hills, and will be better prepared for their next adventure. “Anyone heading into the hills at this time of year should pack a torch and spare batteries, even if they expect to be down before nightfall. “It’s all too easy to lose time through poor weather, injury, fatigue or navigational problems, and being out on the hills in the dark in October without a torch is a serious matter. “The forecast for the night was pretty grim with dense cloud and heavy rain, and the group was very lucky to be spotted by the helicopter when they were. An hour later the weather had closed in and the chopper would have been unable to fly. 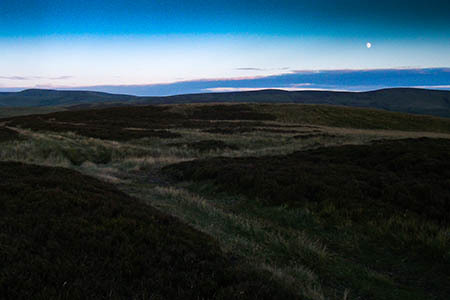 “Walkers shouldn’t underestimate the Pennine Way. It’s difficult to follow in places, especially in the dark, and can be extremely boggy and hard going between Lamb Hill and Chew Green. “As a team, we’re very keen to encourage people to use the hills for recreational and to challenge themselves. Pete Roberts, team leader of the Northumberland National Park MRT said all involved were delighted that the group had been found and rescued so quickly. He said: “We’re very satisfied that our teams worked so well together in this early run before the really bad weather sets in, and delighted that these young people are safe. “Even though it was relatively mild last night, the wind on the higher ground meant that there was a risk of the group becoming dangerously cold without the proper clothing and equipment for the prevailing conditions. Yet again, the stupidity amazes me...25miles over the Cheviots & they left at lunchtime?? Carrying only one Torch between them all and inadequate clothing...........absolutely crazy!! Ive walked the Cheviots with some D of E groups in August, it was cold and wet then, so i can't imagine walking it in October and so ill prepared! !